Travis Nichols is i like apple juice. I like apple juice too and I love his artwork. This door hanger cracks me up and I wish hotels used these as their Do Not Disturb signs. Previous versions were silkscreened, but for the time being Travis is hand doodling these. I love a good doodle! I especially like the tiny detail where the back of The Bible says “by God”. Travis is an earth-loving vegan and uses recycled goods and all of the prints on his site are made with soy inks. Awesome! Reducing, Reusing, Recycling: sure, everyone is doing, but not everyone is doing it as well as Muse Glass. 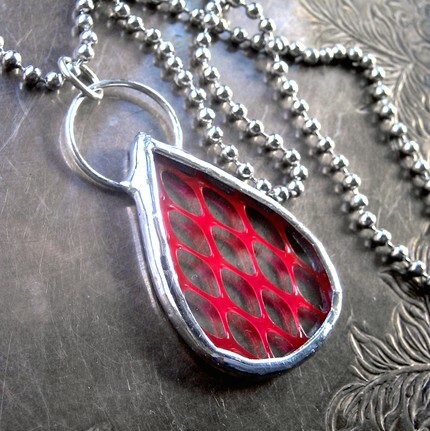 Ever thought to save that plastic mesh bag that your beloved oranges came in and save it until you cut it up and make it into gorgeous jewelry? Clearly, you are not Hayley Rupersburg. She creates a vast array of products from lamps to vases to stained glass jewelry, but my favorite is her renincarnations line. Using scraps and bits of things that would otherwise end up in the garbage or in the recyling bin, she creates truly amazing jewelry like this piece.